New 4×8 Card and 5×7 Folded Card Templates! We have seen 4×8 cards and 5×7 folded cards selling like hot cakes lately and so, we wanted to provide you with brand new themes for you and your clients to enjoy! 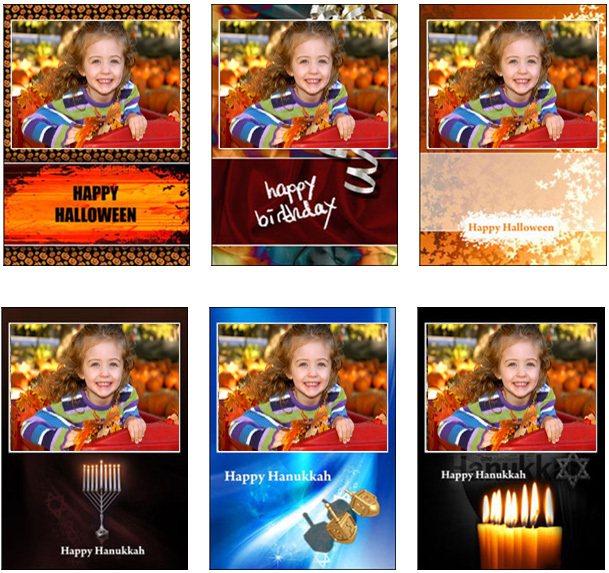 This brand new batch of templates which are now available focus on the 'birthday', 'hanukkah', and 'halloween' theme. Take a look! Hope you enjoy the new additions. We will be working on quite a few other goodies in the next little bit so if you haven't yet, be sure to follow us through Twitter, Facebook, or subscribe to our RSS feed for all of the updates! This entry was posted on Monday, September 20th, 2010 at 3:44 pm	and is filed under Blog. You can follow any responses to this entry through the RSS 2.0 feed. You can leave a response, or trackback from your own site.